In an attempt to fix the many problems with the film, author Hank Searls (the “nationwide #1 bestselling author of Jaws 2“) makes things even worse, with a story that doesn’t feature a shark killing anyone between pages 14 and 240, a bizarre story about the cartel and that major plot point: voodoo. THE PROBLEM: A Great White shark follows the widow of Chief Brody to the Bahamas to continue killing her family. 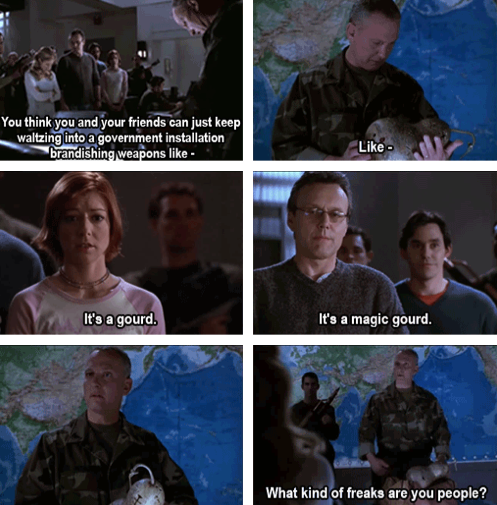 THE SOLUTION: The shark is killing off the Brody family, but only because he’s been placed under a voodoo curse thanks to Michael Brody’s recent destruction of a voodoo doctor’s magic gourd. That other old story. 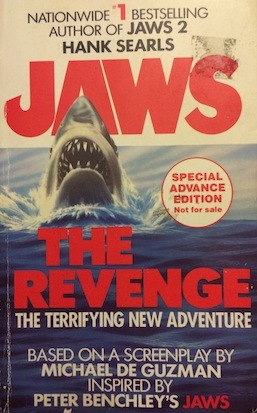 THE PROBLEM: In the original novel, Jaws, the characters are so horrible that you begin to root for the shark. THE SOLUTION: Make them even more horrible! While Ellen Brody used to insult her children’s homework, tells her son his PhD work is “beneath” him and thinks it’s okay to feel good about physically punishing your children to get some contact with them, the other characters are no better. Michael seems to think his wife can’t have a job and be a mother, reassures her that she’s a good person because she’s “pretty” and a “wonder in the sack” and desperately wishes they could have a son instead of his lame daughter. THE PROBLEM: For the most part, the terrifying shark barely kills anyone and isn’t all that scary. THE SOLUTION: Add in a scene in which the shark cures a rich businessman of his alcoholism which just makes you like it more. I wish I was making this stuff up. THE PROBLEM: No one talks about that time Dennis Quaid as Michael Brody was terrorized by a shark at SeaWorld. Not even Michael Brody. THE SOLUTION: Never ever mention that time Michael Brody dealt with a 3-D shark while working at SeaWorld. THE SOLUTION: Michael Brody is protecting the town’s commerce which has suffered as of late by tracking the shark with his partner Jake so as not to ruin the annual Junkaroo festival. See also: almost the exact same plot from Jaws. THE PROBLEM: The original Jaws story diverted too much time to a mob subplot and not enough time to a man-eating shark. THE SOLUTION: Add in a cartel subplot starring Hoagie which takes away time from a not as man-eating shark. Although to be fair, this gives us the most ridiculous scene in the whole story, specifically when a cartel member on water-skis kills a failed hit man with his Uzi. THE PROBLEM: The film seems to be under the impression that sharks roar and explode upon impact. THE SOLUTION: As in the original novel, the shark does not roar or explode and instead dies a quick and anticlimactic death followed by much rejoicing. THE PROBLEM: There just weren’t enough horrible puns about seaside animal life. THE PROBLEM: One of the worst uses of Michael Caine ever. THE SOLUTION: Add back in all the Michael Caine plot lines that were deleted from the original film. For obvious reasons. THE PROBLEM: Film was so terrible that we never got that 19th sequel we were promised in Back to the Future Part II. THE SOLUTION: Build a time machine. Join me next year for another Shark Week, same shark time, same shark channel when I take on Sharcano: the thrilling story about sharks made of liquid magma.